What, then, is the Singularity? It’s a future period during which the pace of technological change will be so rapid, its impact so deep, that human life will be irreversibly transformed…The key idea underlying the impending Singularity is that the pace of change of our human-created technology is accelerating and its powers are expanding at an exponential pace. Exponential growth is deceptive. It starts out almost imperceptibly and then explodes with unexpected fury—unexpected, that is, if one does not take care to follow its trajectory. As each newly appropriated force increased the attraction between the sum of nature’s forces and the volume of human mind, by the usual law of squares, the acceleration hurried society towards the critical point that marked the passage into a new phase as though it were heat impelling water to explode as steam…The curve resembles that of the vaporization of water. The resemblance is too close to be disregarded, for nature loves the logarithm, and perpetually recurs to her inverse square. For convenience, if only as a momentary refuge, the physicist-historian will probably have to try the experiment of taking the law of inverse squares as his standard of social acceleration for the nineteenth century, and consequently for the whole phase, which obliges him to accept it experimentally as a general law of history. If values can be given to these attractions, a physical theory of history is a mere matter of physical formula, no more complicated than the formulas of Willard Gibbs or Clerk Maxwell; but the task of framing the formula and assigning the values belongs to the physicist, not to the historian…If the physicist-historian is satisfied with neither of the known laws of mass, astronomical or electric, and cannot arrange his variables in any combination that will conform with a phase-sequence, no resource seems to remain but that of waiting until his physical problems shall be solved, and he shall be able to explain what Force is…Probably the solution of any one of the problems will give the solution for them all. And each of these men sees exactly what he wants to find in this phenomenon, which amounts to a kind of Rorschach test for futurists. On my bookshelf, I have a book titled The 10% Solution to a Healthy Life, which outlines a health plan based largely on the work of Nathan Pritikin, whose thoughts on diet—and longevity—have turned out to be surprisingly influential. Its author says of his decision to write a book: “Being a scientist and a trained skeptic, I was always turned off by people with strong singular agendas. People out to save my soul or even just my health or well-being were strongly suspect. I felt very uncomfortable, therefore, in this role myself, telling people how they should eat or live.” The author was Ray Kurzweil. He makes no mention of the singularity here, but after another decade, he had moved on to such titles as Fantastic Voyage: Live Long Enough to Live Forever and Transcend: Nine Steps to Living Well Forever. Immortality clearly matters a lot to him, which naturally affects how he views the prospect of accelerating change. By contrast, Adams was most attracted by the possibility of refining the theory of history into a science, as Campbell and Asimov later were, while Fuller saw it as the means to an ecological utopia, which had less to do with environmental awareness than with his desire to free the world’s population to do whatever it wanted with its time. Kurzweil, in turn, sees it as a way for us to live for as long as we want, which is an interest that predated his public association with the singularity, and this is reason enough to be skeptical of everything that he says. Kurzweil is a genius, but he’s also just about the last person we should trust to be objective when it comes to the consequences of accelerating change. I’ll be talking about this more tomorrow. By now, you’ve probably figured out the punchline. 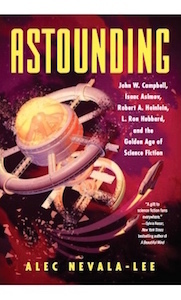 The first writer whom I quote above is John W. Campbell, writing in an editorial in Astounding Science Fiction in 1949. Campbell died in 1971. The second source is Robert Anton Wilson, who added elsewhere in Cosmic Trigger, which was written in 1977: “Since DNA was discovered in 1944, the biological revolution (including longevity, and possibly immortality) should be peaking in 2004.” Wilson died in 2007. The third quote is from Ray Kurzweil, who published The Singularity is Near twelve years ago. Kurzweil is still around, and as a senior director of engineering at Google, he’s certainly in a better position than his predecessors to devote actual resources to the promised revolution in longevity. And while it may well happen in my lifetime, as the earlier examples indicate, it’s far from certain. A child born when Campbell wrote his editorial would be nearly seventy now, which reminds us that we’ve been hearing these promises for a long time—and it hints at an important distinction between the actual argument and its rhetorical presentation. The assertion that technology advances at an exponential rate is convincing enough, and so is the idea that we’ll eventually reach a point when death can be indefinitely postponed, although your mileage on the latter notion may vary. But the statement that the generation in which the author is writing is the one that will witness this breakthrough is purely a rhetorical device, with nothing in particular to back it up. (On some level, it’s as old as as the Gospel of Matthew: “Truly, I say to you, there are some standing here who will not taste death until they see the Son of Man coming in his kingdom.”) There may come a time when we’ll be able to live for as long as we like. But it will take more than wishful thinking to get there. Arthur C. Clarke famously argued that our politicians should read science fiction, instead of westerns and detective stories, and Isaac Asimov, as we’ve seen, thought that an early interest in good science fiction was the best predictor of children who would become the great scientists of tomorrow. As I look around the world today, though, I worry that we’re suffering from a lack of science-fictional thinking. And it isn’t just the fact that America can no longer go into space. It’s that our dreams have grown smaller, and the most ambitious visions are greeted with a dismissive tweet. George W. Bush’s proposal to go to Mars was admittedly hard to take seriously, given its complete lack of specifics, but when the timeline of DARPA’s 100-year Starship Study makes it clear that nobody expects to go to the stars within the next century, I have to wonder what happened to the national will that put a man on the moon using computers like this. And my greatest fear is that we’ve lost the ability to even talk about such issues in suitably cosmic terms. These days, only a handful of public intellectuals seem willing to talk about the future in ways designed to expand our sense of the possible. One is Ray Kurzweil, whose concept of the singularity, perhaps the most exciting—and lunatic—of all forms of futurism, has finally crossed over into the mainstream. Another is Freeman Dyson, the legendary physicist and mathematician who made several practical, lasting contributions to speculative fiction, notably the concept of the Dyson sphere, almost in passing. Both men are geniuses, and both are willing to take outlandish positions. As a result, both often seem faintly ridiculous themselves. Kurzweil, with his line of longevity supplements and obsession with the idea of his own immortality, can occasionally come off as a snake oil salesman, while Dyson has been roundly attacked as a global warming skeptic. And although Dyson’s arguments deserve to be taken seriously, there doesn’t seem to be a place for them in the mainstream dialogue on climate change, which reflects less on his ideas themselves than on the limitations we’ve subconsciously imposed on the debate. Dyson’s treatment in the media has been particularly sobering. He doesn’t deny that global warming exists, or that it’s primarily caused by human activity, but questions whether it’s possible to predict the consequences using existing models of climate change, and believes that the danger is overblown compared to other risks, such as global poverty and disease. Dyson also argues that the problem of climate change isn’t social or political, but scientific, and has proposed a number of seemingly farfetched solutions, such as planting a trillion trees to absorb excess carbon dioxide. Perhaps most notoriously, he believes that global warming itself might not be entirely a bad thing. Rather, it will be good for some species and bad for others, a general “evening out” of the climate in a post-Darwinian world driven less by natural selection than by human activity. As a result, he has been widely accused of being oblivious, uncaring, or demented, notably in a fascinating but profoundly disingenuous piece by Kenneth Brower in the Atlantic. Many of Dyson’s ideas are impractical, or simply incorrect, but it doesn’t seem wise to dismiss a scientist universally regarded by his colleagues as one of the smartest men in the world. And the more one looks at Dyson’s opinions, the more obvious it becomes that they need to be part of the conversation. This isn’t a politically motivated “skeptic” whose ideas are so far off the map that they don’t even deserve refutation; it’s a profoundly original mind approaching the problem from a novel perspective, drawing conclusions that have the power to shake us into new ways of thinking, and as such, he deserves to be celebrated—and, when necessary, refuted, but only by critics willing to meet him on equal terms. He may come up with outlandish proposals, but that’s what science-fictional minds do. Dyson may not have the answers, but only a system of public discussion capable of engaging his ideas will result in the answers we need. And if we can’t talk about his ideas at all, it’s our loss.